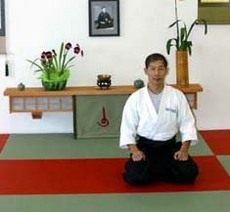 Hoa Newens Sensei extended his wrists to me as we sat in seiza, facing each other. We had paired off to do "kokyu dosa," the closing technique in Goto Sensei's class at the 2004 Memorial Day Gashuku at Lake Tahoe. I grabbed his small wrists and he became animated as though by some upwelling force expressing itself through his body and into mine. He moved smoothly, opening like some kind of carnivorous flowering plant, enticing me all along to move with him into the trap. Ever since that time I have tried to create that same feeling for my ukes during kokyu dosa. Of course if you move jerkily, or too fast, or too soon, the spell is broken and you lose the magic. Newens Sensei is one of the most thorough and precise teachers of Saito Sensei's weapons curriculum, or buki waza, that I know of. The buki waza is a tremendously important category of training. It generates kokyu power, and it expresses the deep parallel, or Riai, that relates the weapons practices with the empty-handed techniques. However important, Saito Sensei's buki waza curriculum has not been thoroughly captured and presented in books or videos. This is in part because there is so much material on so many levels, and because the practices are always changing. I remember Pat Hendricks Sensei explaining to us at the 2002 Saito Memorial Seminar, "practices go in and out of fashion; old ways evolve into new ways, and then sometimes the old ways come back." Recently, thanks to Newens Sensei, a new, more thorough and structured demonstration of the buki waza curriculum is available in his two-DVD set, Aikido Curricuulum: Vol 1 & 2, Aiki Ken and Aiki Jo. This set is not inexpensive at $48 per DVD, but for Aikidoka who want a training guide to buki waza its thoroughness and clarity make it a highly valuable asset. Until now the most incompletely documented of Saito Sensei's weapons forms has been the Ken Tai Jo, jo on sword paired awase. Bits and pieces of these awase do exist in circulation in the US and especially in Europe, but a structured presentation of the 7 basic awase, with standard henkas, has been completely missing. Newens Sensei fills this void with a very detailed and easy to follow demonstration of the ken tai jo awase, in the order shown by Saito Sensei during his late 1990's seminars in Rome and Berlin. Another exotic set of practices, the 13 no jo paired awase, are included on Newens Sensei's Jo DVD. He presents the discontinuous single-move awase that Saito Sensei taught during the 1990s, and he adds a continuous version of the 13 awase that seems to capture nicely the spirit of the solo kata. I have seen various attempts to make the 13 jo awase continuous, and this one looks the most in line with the spirit of Iwama Dojo weapons practices. In the DVDs Newens Sensei seems more interested in organizing and preserving Saito Sensei's curriculum than in expressing his own Aikido. So, to get a feel of Newens Sensei's Aikido you'll probably have to visit his dojo in Davis, California, or be lucky as I was to pair off with him at a Gashuku or seminar. I promise, it's something you won't forget.